On the quiet eastern side of Naxos we rent 4 beautiful stone houses for 2-4 people. Here you can relax in peace and delve into the Greek life and culture. Each villa has a total of 60 square meters with private patio with stunning views of the Aegean Sea. The houses consist of one large room, which is divided by a curtain into a sleeping area with two beds and a living area with kitchenette, fireplace and pullout sofa bed natursteinernem. The facility is located on a 7000 sqm plot with vineyards, olive trees and vegetable gardens, from which our guests can provide nothing with our organically grown vegetables and fruits in season, as well as with our delicious homemade wine. In 20 m distance from the property there is an idyllic, clean sandy beach where you can peacefully enjoy the water and sun. On the quiet eastern side of Naxos we rent a beautiful stone house for 2-4 persons. Here you can relax in peace and delve into the Greek life and culture. The house has a total of 60 square meters with private patio with stunning views of the Aegean Sea. It consists of one room which is divided by a curtain into a sleeping area with two beds and a living area with kitchenette, stone fireplace and pullout sofa bed. There is a vine-entwined, shady pergola available. In 20 m distance from the property there is a clean sandy beach where you can peacefully enjoy the water and sun. In the area there are numerous hiking opportunities. Plot: The complex is located on a 7000 sqm plot with vineyards, olive trees and vegetable gardens, from which our guests can provide nothing with our organically grown vegetables and fruits in season, as well as with our delicious homemade wine. Beach: Directly in front of the complex is a small, but very clean and quiet sandy beach that is suitable for children and where you can snorkel very well and can get to know the diverse and very rich underwater world around. Environment: Hikers can explore many old paths the island and get to know interesting things to her countless sights and enjoy its magnificent landscapes. We can help you with tips and information on the history, archeology, folklore, geology and flora and fauna of the island. Let yourself be captured by the charm of the diverse island of Dionysus! Staying with Astrid and Nikos at Azalas is a unique opportunity and one not to be missed. Proof of that is the guests who have been coming back for the past 10+ years. The location is on the east coast of Naxos and a 10 minute drive north of Moutsouna. We swam every day in the Aegean at the beautiful cove across the road. We were lucky to be there to see the crush and were treated to decanters of wine, fresh baked bread and fruits as they ripened. There are three restaurants in town and a grocery store, so you can eat out or use your cottage's well equipped kitchen. The stone cottages are lovely with coastal views, wifi, air con, heater, fireplace and patio out front. We were in Greece for the month of September and are so glad to have spent a week at Agios Dimitris. Our thanks to Astrid and Nikos for sharing their timeless Greek island lifestyle with us. It doesn't get better than this! We spent a week in this idyllic setting in a charming cottage overlooking the tiny Agios Dimitrios chapel sitting on the Aegean Sea. Our stone cottage - hand-built by our host Nikos - was just beautiful, very comfortable, and well stocked with everything we needed. We found the stone work of all the cottages just remarkable and a real joy to spend our days . We swam each day at the sandy beach immediate opposite our cottage in crystal clear water. Astrid and Nikos were so friendly and helpful, going out of their way serving us the best home-made, wood-fired bread that we have ever tasted, and also a goat dinner which is a typical Greek specialty. So Delicious! In addition, we had 2 fabulous fish dinners in the nearby coastal town of Moutsouna. The scenery in and around Azalas is most beautiful and the mountainous roads of Naxos provide just stunning views of the island. We made day trips to Apiranthe and Chora which were both very picturesque and sparsely populated. Lastly we would like to thank both Astrid and Nikos for welcoming us into their lovely home. We hope to return some day in the future. 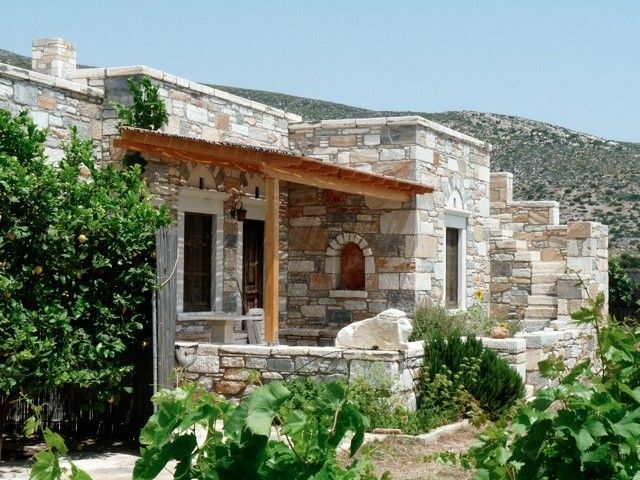 The house is located directly on the Aegean coast on a property with oil grove and vineyard. Just before the complex is a small, quiet and clean sandy beach with nice snorkeling spot. In 3 kilometers away lies the idyllic harbor town of Moutsouna, 13 kilometers in the mountains, this traditional village Apiranthos. Walks through the unspoilt Mediterranean landscape with many interesting sights as the Schmirgelminen of Naxos, Byzantine churches and ancient monuments are possible.